Recently, numerous studies have reported convincing data suggesting that chromosome instability may not be only a trigger of cancers but a possible mechanism for a wide spectrum of brain diseases. According to our original experience, chromosome instability is commonly observed during karyotyping of children with neuropsychiatric diseases and congenital malformations. To understand the mechanisms of non-cancerous diseases potentially mediated by chromosome instability, which may represent an important target for molecular diagnosis and therapeutic interventions, new algorithms for molecular cytogenetic diagnostics appear to be required. Here, we address the potential of cytogenetic, molecular cytogenetic and bioinformatic analysis in children with intellectual disability, autism, epilepsy, and/or congenital malformations. Since we have found chromosome instability to be a promising biomarker of non-cancerous brain diseases, we have proposed an algorithm for investigating molecular and cellular mechanisms of neuropsychiatric disorders and congenital malformations mediated by alterations to genome stability maintenance. A growing body of cytogenetic and genomic research has evidenced for a wide range of genome variations to be associated with intellectual disability, autism, epilepsy and congenital malformations [1,2,3,4,5]. Chromosomal instability (CIN) represents a special type of genetic variations, which may stochastically alter numerous genes resulting in multilateral pathology including abnormal functioning of the central nervous system (CNS). Recently, such somatic genome variations have been shown to be a common mechanism of neurodevelopmental, neuropsychiatric and neurodegenerative diseases [6,7,8,9,10]. Moreover, it has been previously demonstrated that several CIN types (e.g. sporadic aneuploidy, random structural chromosomal abnormalities and interphase chromosomal breaks) are potential biomarkers for abnormal processes (cascades of processes) producing CNS pathology [11,12]. Usually, CIN is considered the main mechanism of almost all life-threatening oncological diseases and a reliable cellular hallmark of malignancy [13,14,15]. However, CIN is shown to be a key element of pathogenetic cascades of molecular and cellular processes associated with reproductive disorders , renal pathology , neurological disorders and mental illness [3,4,10,12]. Additionally, CIN is shown to mediate various changes in intellectual functioning influenced by a negative impact of the environment (i.e. stress) on the human body . Finally, it is assumed that CIN-related variations of somatic cell genomes are able to cause tissue aging and cellular senescence . Still, looking through available biomedical literature, one can make a reasonable conclusion that CIN has rarely been considered as a biomarker for brain diseases, despite the proven role in the pathogenesis of CNS disorders [10,12,20,21]. Since CIN completely corresponds to the biomarker definition [22,23], we have addressed the potential of molecular cytogenetic analysis of unstable karyotypes in biomarker research for investigating molecular and cellular mechanisms of diseases presenting with intellectual disability, autism, epilepsy and/or congenital malformations. Retrospectively, we have analyzed data of cytogenetic karyotyping, molecular cytogenetic FISH-analysis, molecular karyotyping and bioinformatics studies of the Russian cohort of children with intellectual disability, autism, epilepsy and/or congenital malformations [24,25,26,27,28,29,30]. Cytogenetic study of chromosomal instability was performed by analyzing at least 30 metaphase plates (cells) per patient. Molecular-cytogenetic research was carried out using fluorescence in situ hybridization (FISH) with original DNA probes [31,32,33] scoring 100 metaphase plates and 1000 interphase nuclei per patient. Molecular karyotyping data were processed using original bioinformatics method of assessing the functional consequences of genomic variations. The method is based on variability in the gene expression between tissues (assessed in silico), interactome and metabolome analyses for the identification of changes in molecular pathways caused by regular (heritable or de novo) genomic variations . CIN has manifested as aneuploidy, large structural rearrangements (translocations, deletions, duplications, and inversions), chromosome fragility and chromosomal breaks (including interphase chromosome breaks). In the cases of aneuploidy, we applied FISH with original chromosome-enumeration DNA probes. CIN presenting as monosomy and trisomy has been confirmed in all of these cases. CIN cases have also exhibited 4-9 copy number variations (CNV) encompassing genes, involved in the pathways to genome instability and somatic mosaicism (genome stability, DNA reparation/replication, mitotic checkpoint, cell cycle regulation and programmed cell death) [35,36,37]. Using bioinformatics for processing molecular karyotypes and addressing previously published data [8,12,18,20,25,38,39,40,41,42], we have concluded that a proportion of these cases of intellectual disability, autism, epilepsy and/or congenital malformations is likely to be associated with chromosomal instability, which is an element of the pathogenetic cascade and thereby, should be recognized as a contributor to the phenotypic manifestations. Interestingly, changes in the molecular pathways of cell cycle regulation and programmed cell death were mainly associated with aneuploidy. Genomic variations associated with modifying effects on the molecular pathways of genome stability maintenance and DNA replication/repair were predominantly associated with CIN, manifested as large structural rearrangements, chromosome fragility, and chromosomal breaks. Accordingly, different CIN types may be recognized as biomarkers of altered processes leading to CNS dysfunction. In conclusion, it seems important to address regular genomic variations associated with CIN alongside with molecular cytogenetic assessment of chromosome behaviour (i.e. CIN) to determine disease mechanisms. The state-of-the-art molecular genetic techniques used for whole genome scanning (i.e. next-generation sequencing or microarray CNV analyses) are indisputably the most efficient ones for uncovering genome variations [5,43,44]. However, numerous types of chromosomal variation and CIN (i.e. chromosome fragility, interphase chromosome breakage, morphological alterations to chromosomes etc.) cannot be appropriately addressed by these technologies developed for studying whole fractions of DNA isolated from large cell populations [4,12,20,45,46,47]. Taking into account the importance of CIN analysis and the importance of CIN as a biomarker, we suggested that there is a need to reconsider the generally accepted diagnostic approaches to chromosomal abnormalities. Generally, cytogenetic analysis and molecular karyotyping are usually considered as two consecutive/parallel stages of diagnosing chromosomal imbalances [4,48,49]. We propose that the data sets obtained by each of these methodologies are complementary rather than hierarchical. For example, cytogenetic data are commonly erroneously considered secondary as to the results of molecular karyotyping; occasionally, the diagnosis of chromosomal pathology is unacceptably limited to molecular karyotyping. Thus, to offer new possibilities for (molecular) cytogenetic diagnosis, a number of additions to a commonly accepted workflow for diagnosing chromosomal abnormalities may be made. More precisely, cytogenetic analysis should be supplemented with FISH-based molecular cytogenetic analysis of a larger number of metaphase plates and/or interphase nuclei. Molecular karyotyping should be performed with an extended bioinformatics analysis of functional consequences of genomic variations to unveil the impact on molecular pathways involved in maintaining genome stability. It is to note that such genomic variations are indirectly involved in the pathogenesis being, therefore, frequently overlooked [37,39]. Thus, cytogenetic and FISH-based analyses of CIN should be complemented by the aforementioned bioinformatics evaluations. Considering that CIN is a promising biomarker of non-cancerous pathology, the algorithm for identifying molecular and cellular mechanisms of disease mediated by CIN would look as follows: firstly, two sets of data are to be simultaneously obtained: (1) cytogenetic and molecular cytogenetic (FISH) data on the nature of CIN and intercellular karyotypic variations (analysis of large cell population in the CIN context) and (2) molecular karyotyping data processed by advanced bioinformatics for uncovering functional consequences of regular (non-mosaic) genomic variations; secondly, correlative analysis between these two data is made. Figure 1 shows the algorithm in a cartoonish manner. Figure 1 Schematic depiction of the algorithm for investigating the molecular and cellular mechanisms of diseases mediated by CIN. 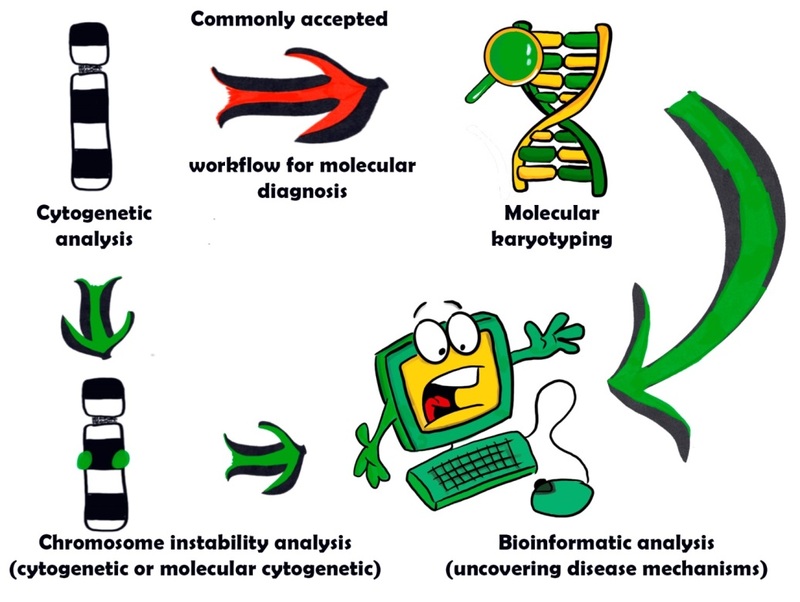 To succeed, one has to follow green arrows or, in other words, to analyze chromosome instability by karyotyping and FISH (analysis of larger amounts of cells) instead of the commonly accepted workflow including only cytogenetic karyotyping and molecular karyotyping; bioinformatics is mandatory for uncovering disease mechanisms. In the post-genomic era, single-cell cytogenetic (cytogenetic karyotyping) and molecular cytogenetic (FISH) genome analyses are generally considered as outdated techniques with limited applicability [50,51,52]. However, a wide spectrum of changes in the genome behavior at the chromosomal level requires cytogenetic and FISH-based analyses (for further details, see [4,7,28,45,46,47,48]). Furthermore, FISH-based approaches to interphase chromosomes have already been shown to uncover mechanisms for brain diseases [12,39,53,54]. We propose to consider cytogenetic and molecular karyotyping not as two consecutive diagnostic procedures but as two complementary procedures necessary for identifying chromosomal and sub-chromosomal genome variations, which are further analyzed for unraveling disease mechanisms. To determine the contribution of CIN to disease pathogenesis during diagnostic research, cytogenetic and molecular cytogenetic (FISH-based) analyses should be performed. The lack of FISH-based analysis of mosaic aneuploidy and CIN would unacceptably diminish the efficiency of these diagnostic procedures. In parallel, molecular karyotyping with bioinformatics analysis of functional consequences of genomic variations for the identification of the effect on molecular pathways to genome instability (i.e. DNA reparation/replication, cell cycle regulation, mitotic checkpoint, and programmed cell death) should be performed. These bioinformatics approaches would shed light on the altered molecular and cellular pathways to maintaining genome stability. The hypothetic alteration may be confirmed by identifying patterns of CIN using cytogenetic and FISH-based techniques. Although cytogenetics is time-consuming and FISH-based methods require an extended set of DNA probes, we still insist their inevitable application because of the lack of alternative methods for studying CIN manifesting as alterations to chromosomal morphology and for genomic mapping of instable chromosomal loci. The combination of cytogenetic, cytogenomic/molecular cytogenetic and post-genomic/interpretational technologies possesses intrinsic potential for molecular and cellular diagnosis, the results of which are able to underlie the development of successful therapeutic interventions for diseases mediated by CIN. All authors performed studies which underlie basic ideas of the article and made theoretical input to article’s content. IYI wrote the manuscript. This work was supported by RFBR and CITMA according to the research project №18-515-34005. McGuffin P, Owen MJ, Gottesman II. Psychiatric genetics and genomics. Oxford University Press, 2004. Norppa H. Cytogenetic biomarkers. IARC scientific publications. 2004; 157: 179-205. Vorsanova SG, Iurov IIu, Kurinnaia OS, Voinova VIu, Iurov IuB. Genomic abnormalities in children with mental retardation and autism: the use of comparative genomic hybridization in situ (HRCGH) and molecular karyotyping with DNA-microchips (array CGH). Zh Nevrol Psikhiatr Im S S Korsakova. 2013; 113: 46-49. Iourov IY, Vorsanova SG, Zelenova MA, Korostelev SA, Yurov YB. Genomic copy number variation affecting genes involved in the cell cycle pathway: implications for somatic mosaicism. Int J Genomics. 2015; 2015.